And welcome to another pre trip report for 2017!! A little introduction we are the terrible twosome me Amy 28 " Disney obsessed and getting worse by the minute! 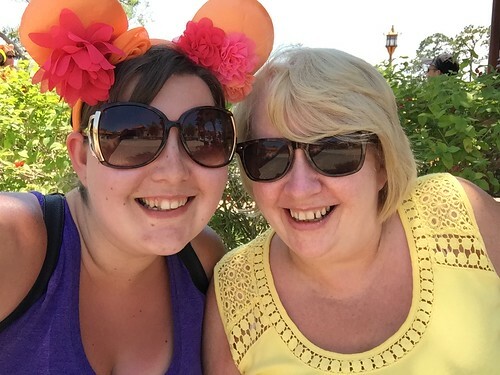 Mam (Sue) sadly not 28.......Disney obsessed but reins me in when I have crazy ideas like "let's go to Disney for the weekend?!" this is us below! So this trip is a complete new experience for us so a little back story when Auntie and Uncle heard about the Flower and Garden Festival and being huge green fingered people they really wanted to visit, me and mam decided we couldn't not see the Food and Wine festival soo........2 trips 2 years running it was! We wanted to originally save a bit of money so we booked Caribbean Beach, personally I wasn't keen on the idea but we also wanted to upgrade to the dining plan so it made sense at the time. We were originally booked for 10 nights but realised we were due to arrive on 1st October and EPCOT was celebrating its 35th Anniversary on that day so we thought we had no flights booked so we would change the booking by a day.....nope no availability unless we went deluxe which was super pricy so we looked into DVC points for 1 or 2 nights and only managed to get Boardwalk Preferred room for 2 nights!!! How perfect! All we had to do now was change CBR to 9 night and add dining plan....I kept putting this off because I still wasn't all too happy about staying at CBR to start with then came the announcement of all the works at CBR so that was it I wasn't staying we decided to swap to POR our good old faithful and upgrade to dining plan " well rang Disney and we could upgrade for an additional PS100 or something to Saratoga Springs WITH the dining plan upgraded " it was going to cost us an extra PS300 to upgrade the dining plan so we jumped at the opportunity! So to recap we have 2 nights in the Boardwalk and 9 nights in Saratoga Springs!! To say we are excited is an understatement!!! Pack the car up, drive to Manchester (staying at the premier inn again), have some food and get some rest for the next day! So no doubt we will be up early this morning jet lag and all that so we will either grab something to eat at the resort or walk to EPCOT (I never thought I'd get to say that!) and go to Les Halles for some breakfast either way I'll be going into the park from International Gateway and heading up to France just to see what It's like before World Showcase opens we have never done it before! We won't stay long as we have FP for Soarin, Living with the Land and Spaceship Earth, we will probably snack a bit round the booths but not much because we will head out of the park to Disney Springs we have an ADR for Paddlefish on the Magical Dining Month (3 courses for $35 how can you turn that down!) so we will head out for that but then back to EPCOT to finish off the night with the birthday park before taking our walk back to our room! Have a little later start and head over to Disney Springs collect our gift cards and grab some lunch before making our way to Animal Kingdom we have FP for Flight of Passage (YIPPEE!!!!!!!) Kilimanjaro Safaris and Expedition Everest, we also have Rivers of Light dining package at Tiffins " very excited about this! Magic Kingdom again for us FP for Big Thunder Mountain, Haunted Mansion and 7 Dwarfs Mine Train and we also have Festival of Fantasy dining for Tony's, we are excited to try this as the viewing location we have done before when you could FP and it's an amazing location so can't wait to do it again! Think we are planning EPCOT for the evening " so many booths so little time! We are heading to Disney Springs for Raglan Road Brunch I'm really excited to try this! We are hoping to try out a "Minnie Van" to get us to Animal Kingdom where we have FP for Flight of Passage, Kilimanjaro Safaris and Expedition Everest, I don't know if we will stay at Animal Kingdom through to the evening or move on to somewhere else the world is our oyster! Last park day " how did that happen! Only 1 place to go and that's Magic Kingdom FP for Big Thunder Mountain, Under the Sea and 7 Dwarfs Mine Train we also have Be Our Guest booked for Lunch, ending the parks portion of the trip with EPCOT making a mad dash around the park to eat all we want to eat! Have a little drink and watch the fireworks, it's a bit of a tradition now! Thanks for taking the time to read this and if anybody is in the same place at the same time etc we would love to meet up with you! Wow sounds like you got an awesome deal with Saratoga! We really enjoyed it when we stayed there in December 2015. Saratoga Springs is our home resort and we it there. I am certain you will also. We really did I hung up and rang Mam as I wasn't with her and it was like "why are you ringing me just do it crazy woman!" Thanks! I hope we love it too we love the feel of POR and it looks like a similar set up right up our street! With both of you guys having experience of staying there any tips on requests etc? We have just got a deluxe studio don't know if that a standard or preferred studio? Or any other general tips feel like a first timer with new resorts haha! One thing you must certainly do is dine at the Turf Club, I rate it as one of the best restaurants at WDW. Awesome ! We love Saratoga Springs, and you can't beat the convenience to Disney Springs & Disney Old Key West resort Disney Springs Morimoto Japanese restaurant is very good, we highly recommend this restaurant for lunch (reservations is highly recommended). Hope you guys have a fantastic time, Cheers. We will second that vote! Wow thanks guys we have a spare dining credit looks like we are going to Turf Club! any recommendations for food choices?! Thanks! we did Morimoto last year and really enjoyed it! we are trying to work our way around all the new food places at Disney Springs I think It's gonna take a while! We stayed in a two bedroom suite in Congress Park right next to the walking path to Disney Springs. This was before they had a standard/preferred distinction on the two bedrooms though. If you're planning on going to Disney Springs a lot (which it sounds like you are) it's a good spot as it's a very short, peaceful walk to wear the old bus stop are used to be at Disney Springs. However, if you can't get that request (because I know it is now preferred) or it is more important to you to be near the main building/pool, then I would definitely put in that request instead. Saratoga Springs is HUGE and we were a loooooooong ways away from the main building out on the far edge of Congress Park. We barely utilized our refillable mugs because it was such a walk. I will also third Turf Club. Our meal there was absolutely fantastic! Can't believe it was only one dining credit per person! well we were thinking we would either really like to be in congress park anywhere or I think its the springs which is near the main building? we didn't get the choice of standard or preferred we just have a deluxe studio so don't even know what that means! its great to get advice from people who have stayed there we have only ever seen it from the Magical Express or from the Boat! wow this place must really be good now I need to find when we can go! Awesome pre-trip as always. Can't wait to here all about it and see what you thought of your new experiences.